On behalf of Admin of JML Law, A Professional Law Corporation posted in Car Accident on Wednesday, Mar 07 2018. If you are concerned about the environmental impact of driving a gas-guzzling car or truck around Long Beach, you may welcome the idea of dockless bicycles, which can be rented as required and unlocked using a smartphone app. Picking a bicycle up when you need it, and dropping it off at another location when you’re done not only enables you to avoid driving as much as you have been but also makes it more convenient to do your bit for the environment. However, as these bicycles increase in popularity, entrepreneurial types have gone one step further and introduced electric scooters. A handy method of transport, sure – but could these electric scooters lead to car accidents and collisions with pedestrians? While these electric scooters and bicycles are convenient, relatively easy to navigate and, of course, potentially a way to reduce your carbon footprint, they are not without their downsides. One conundrum currently facing electric scooter users is where to ride them. It is against the law to ride them on the pavement, although many scooter users are doing so, but is it really safe to be on a reasonably flimsy scooter in amongst heavy Long Beach traffic? Should an electric scooter be involved in a car accident, the consequences could be severe, but so too could the injuries resulting from a pavement-hogging scooter rider colliding with a pedestrian. A 200lb man zooming towards you at around 10 miles per hour probably is not a welcome prospect. San Diego police department is actively working to keep scooter riders off the pavements and wearing appropriate helmets, but have reported that there have indeed been some incidents. No figures were provided regarding the number of scooter-related citations issued to date. 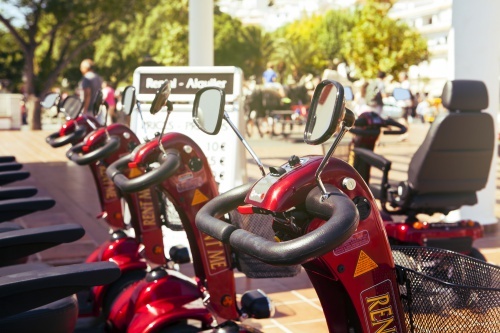 San Diego is currently the only California region where these scooters are prevalent, but it probably will not be too long before we see them elsewhere, and the car accident and pedestrian collision risks become more of an issue. Do You Need a Long Beach Car Accident Attorney? Unless you have been in San Diego recently, you probably have not been involved in an electric scooter-related car accident, but you may have been injured while on your bicycle, driving your own car, or using the pavement in Long Beach. Not all car accidents have serious consequences, however, there are all too many that result in serious, or even catastrophic, injuries and damages. However, a knowledgeable, experienced Long Beach car accident attorney can confidently and competently provide legal representation no matter what the circumstances of your collision. To schedule your free consultation, call us today on 818-610-8800.